I love to shop for holiday décor pretty much anywhere –sometimes you find the best things at the least expected places. Like the dollar store, Dollar General to be specific. I found some fall placemats that I loved at Dollar General so I was looking forward to seeing what they had for Christmas. 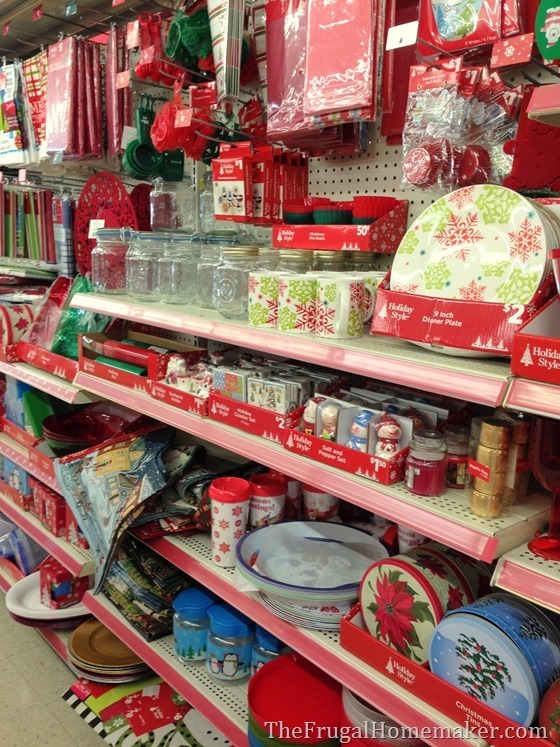 For a small store, Dollar General has a big selection of holiday merchandise. From baking supplies, wrapping supplies, home décor, tableware, kitchen utensils and towels and so much more. 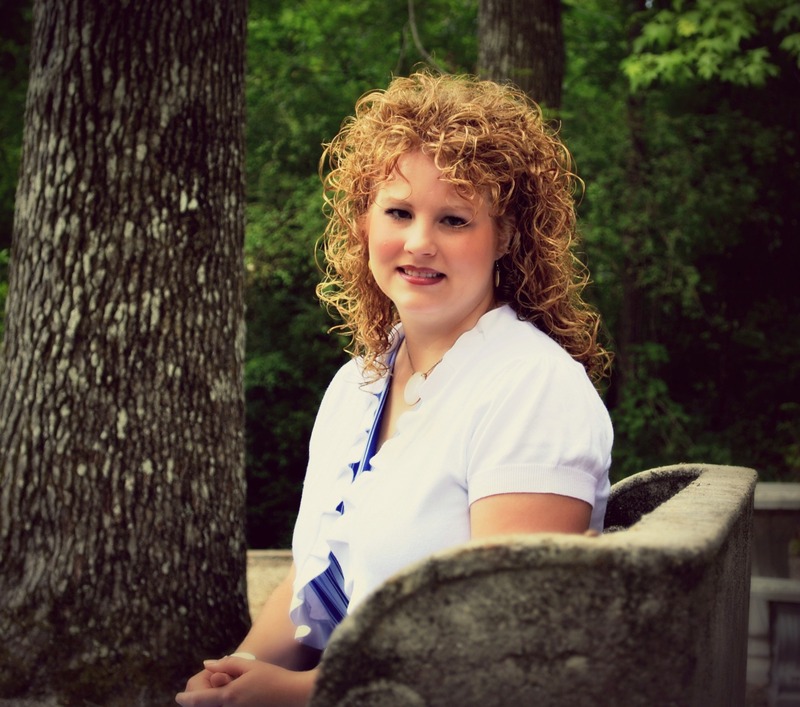 Come see the Dollar General Holiday décor I found! 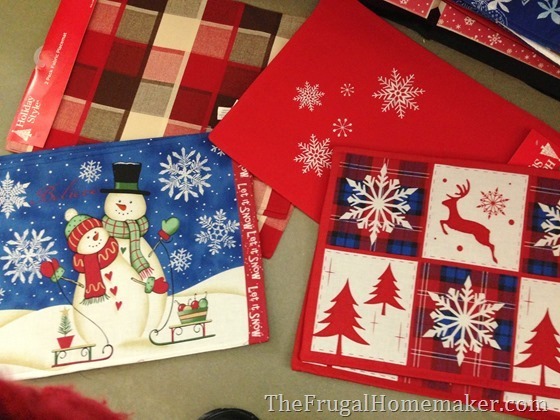 Here’s some of the placemats they have for Christmas. 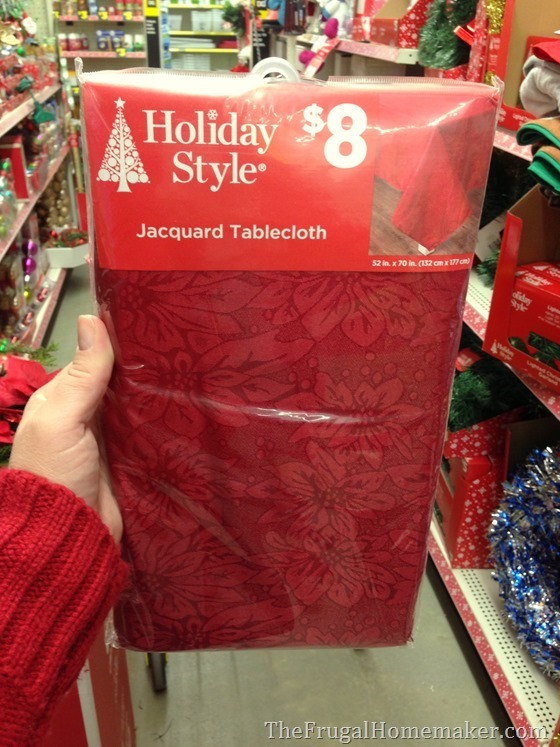 And you can even pick up a pretty tablecloth – for $8.00! Can’t beat that! So when Dollar General challenged me to come up with a holiday tablescape using items from their store, I jumped at the chance. 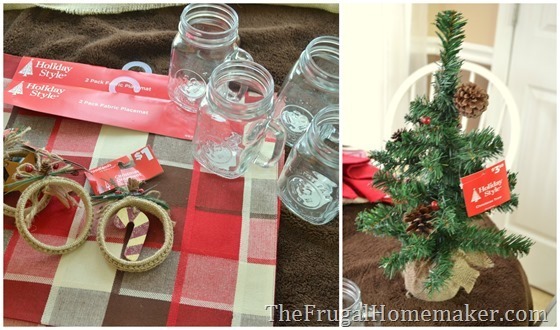 I picked up these plaid placemats, 4 burlap ornaments, a small Christmas tree, and 4 mason jar mugs. I have been wanting mason jar drinking glasses and was so excited when I found these for only $1.50 each! And I created this beautiful natural & woodland themed tablescape. 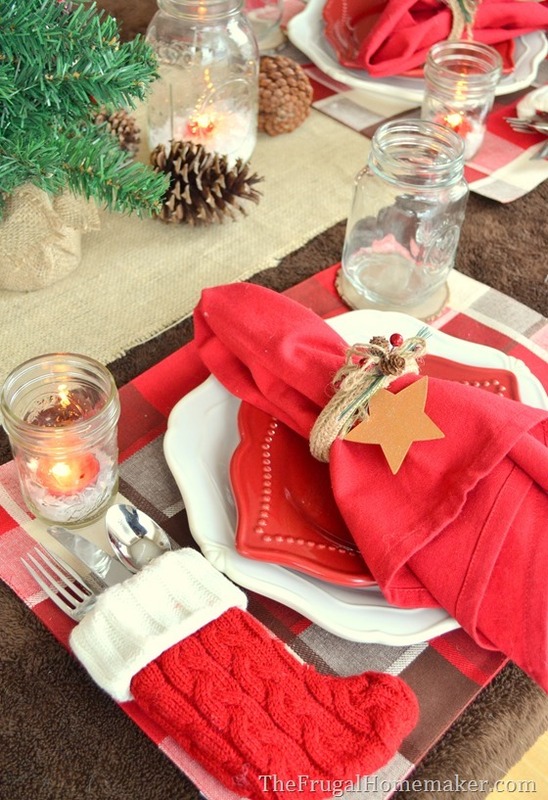 I added a burlap runner and my 4 plaid tablecloths. 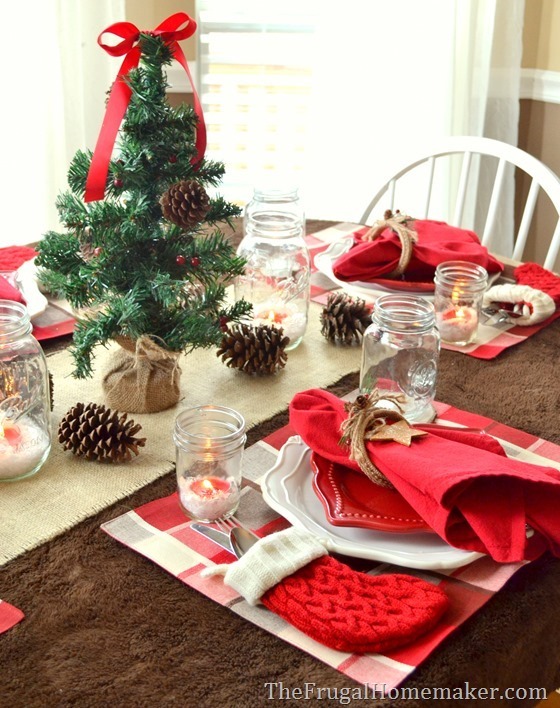 I used the tree as a the centerpiece along with 2 mason jars filled with faux snow and candles. My everyday white plates and red dessert plates were set at each place. Did you envision what I was going to do with the ornaments? I thought they would make the perfect napkin rings and they do! 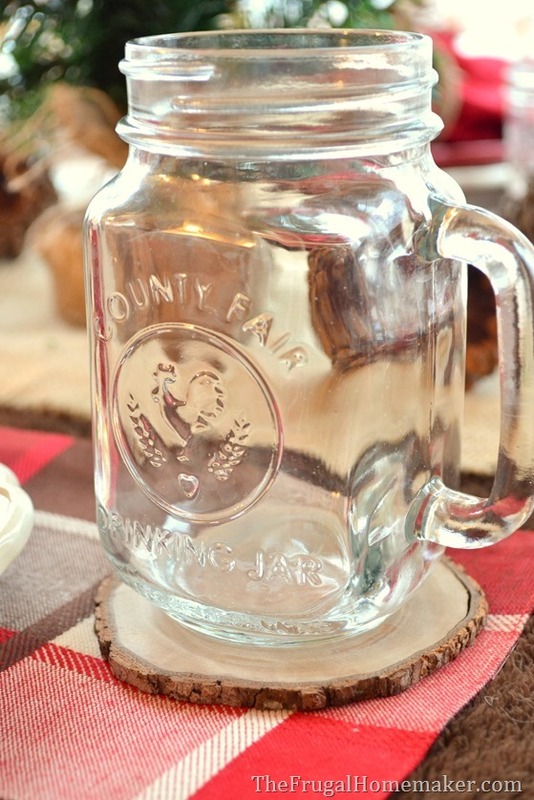 I LOVE these mugs – aren’t they so cute with the county fair saying on the front too? I placed the mugs on a wood slice for some extra impact. When I was shopping, I saw some cute mini stockings and remembered these ones I had at home and an idea I saw on Pinterest. 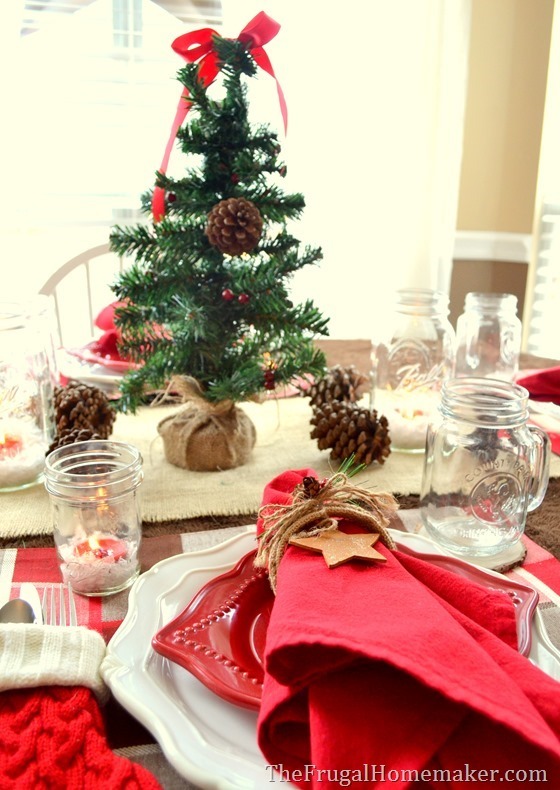 Mini stockings make adorable silverware holders at each place setting. 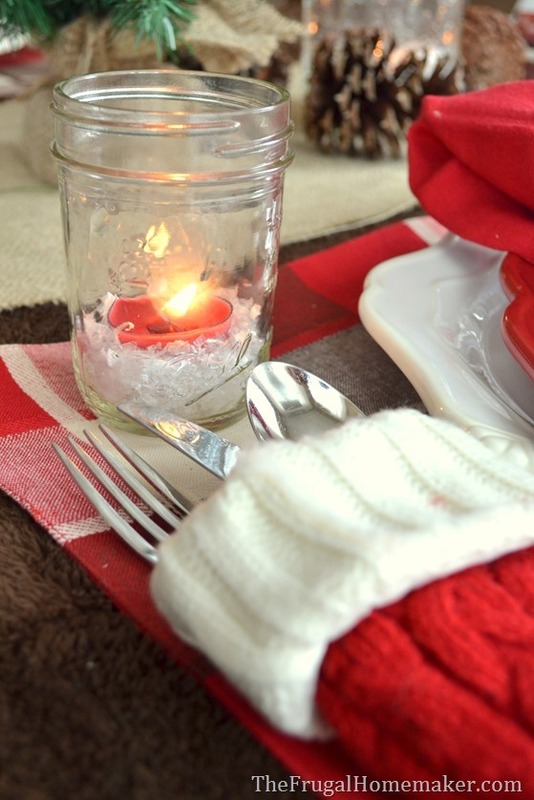 And for some more candlelight and charm, I added pint sized mason jars filled with faux snow and a tealight candle at each place setting as well. Love how this all came together! Using some new pieces from Dollar General, a few things I had, and some pinecones and wood slices from nature. Perfect for a candle-lit dinner during this Christmas season, or for having friends over for a big bowl of soup and homemade bread. 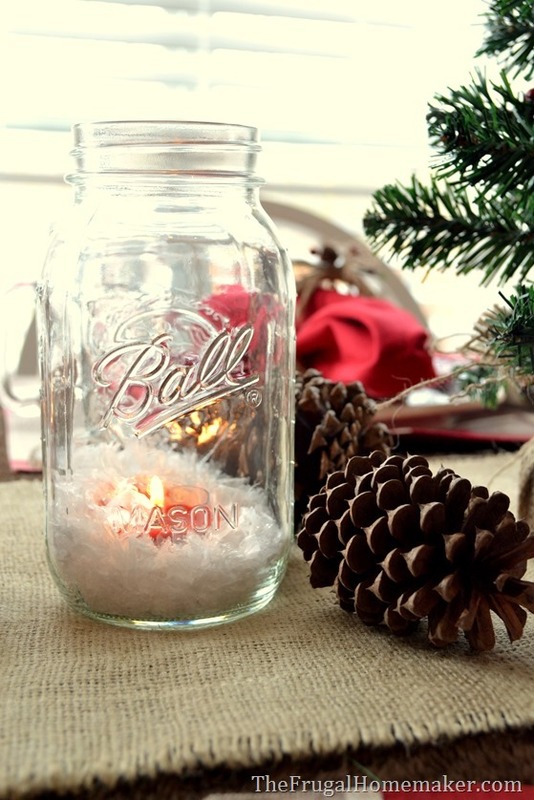 I love when I can incorporated mason jars into my décor! What’s your favorite part of the tablescape? 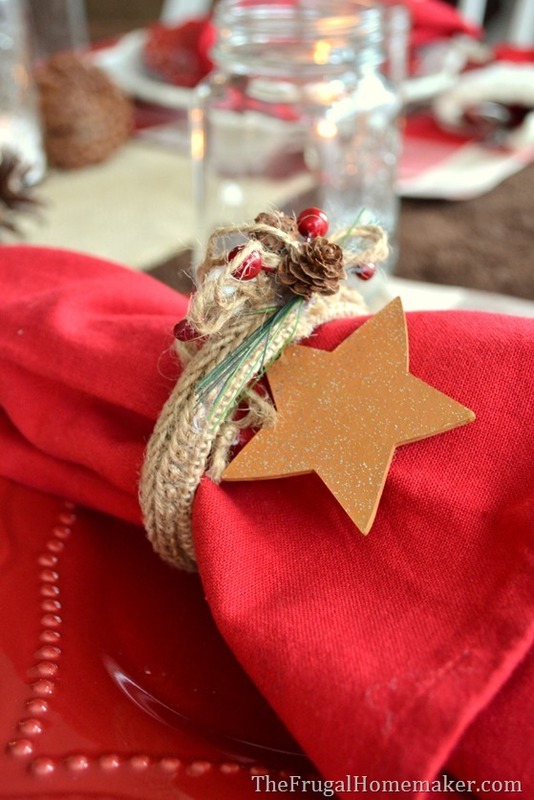 Ever thought of using ornaments as napkin rings? And have you checked out your local Dollar General this holiday season – now you know what you are missing and the relief you could provide for your wallet with their great prices! You certainly met the challenge. Love all your touches. 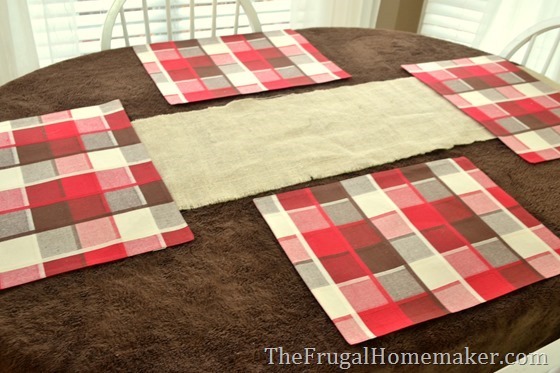 The placemats are pretty,love plaid. Mason jars for 1.50 not a bad deal!! I love it! 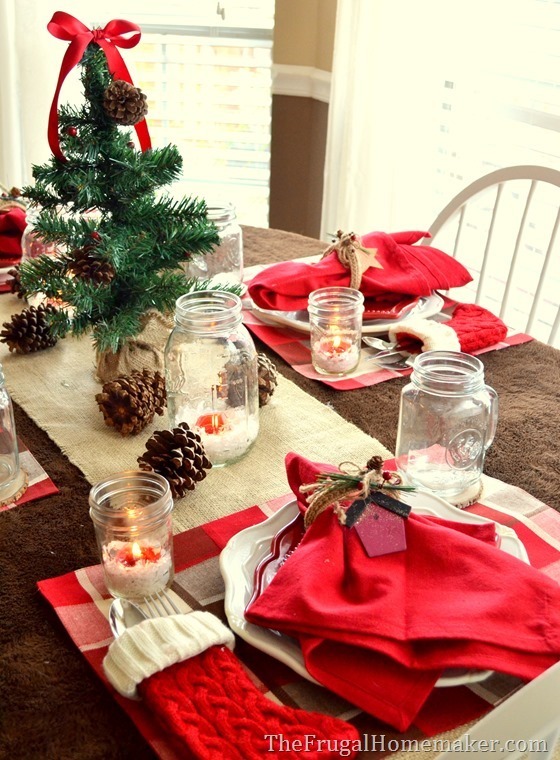 It’s so pretty and festive, comfortable and inviting one to linger at the table, not gaudy or over the top (I tend to go over the top). 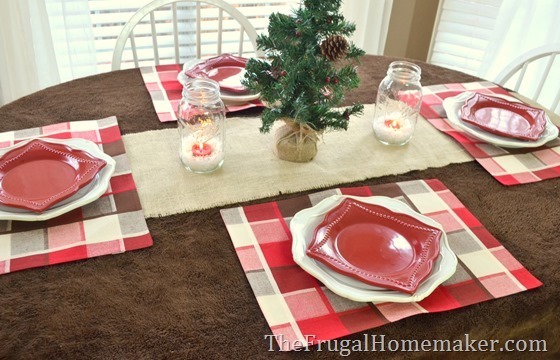 My eye immediately snapped to those plaid placemats – LOVE! You made it look so simple to put that tablescape together, Cristina. Perhaps you will start seeing variations of your tablescape at many blogs going forward, as imitation is the sincerest form of flattery. What do I like? Hmmm, what’s not to like about this table? 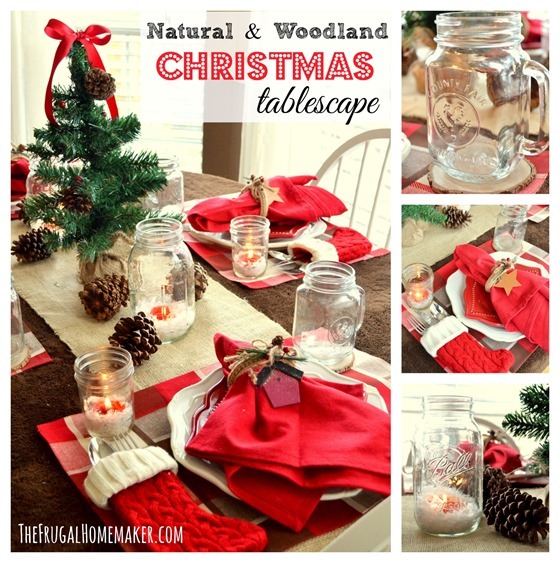 When I saw the mason jars & plaid, I knew this was my kind of setting! Love everything about it. How clever to use the wood slices under the glasses! So welcoming and cozy! You sure met that challenge with a WIN! 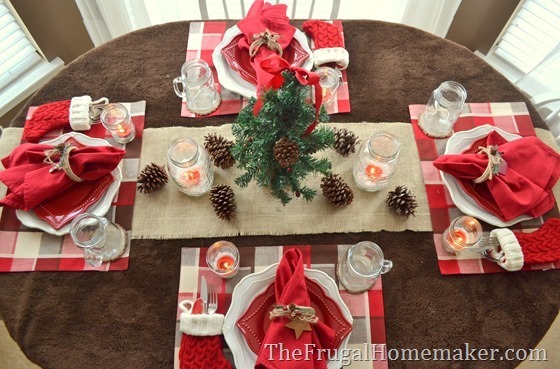 Love it – especially the throw for the tablecloth. Thanks for sharing – looking forward to more great ideas! 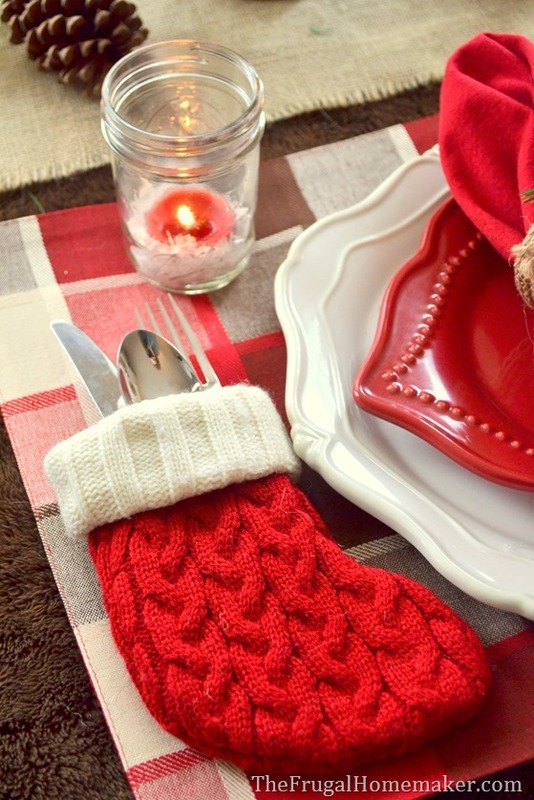 Oh wow, I absolutely love the mini stockings as cutlery holders! I have to pin this, what a fantastic idea! The whole tablescape looks fabulous, but those are my favourite.